“I’m moving out if you let him get that,” my daughter insisted in reaction to my eight-year-old’s recent request for a Big Mac meal at McDonald’s. I hadn’t even yet had a chance to reply to his question before her position on the matter was made abundantly clear. “A tad dramatic, wouldn’t you say?” I replied laughing, well aware of the reasoning that was about to follow. It’s said that birth order plays a part in personality formation. The eldest is apparently a confident, natural leader – “bossy”, some might say, if she were not an eldest child herself. The youngest is allegedly a socially confident charmer who gets away with murder. While the middle child has a whole syndrome assigned to them. As for the favourite – well in theory that role shouldn’t exist, but my fifth child would argue his self-dubbed position to the contrary. 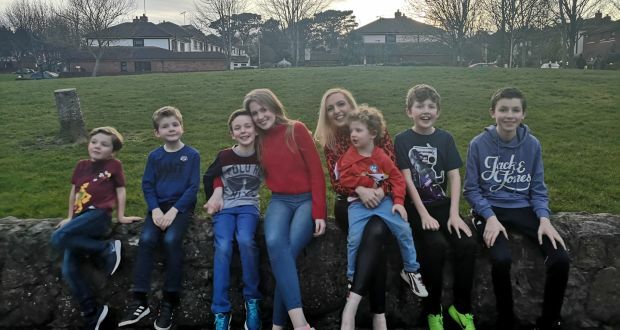 In a house with so many children, I’ve seen how birth order, (which for several of them has proven an ever-movable feast), has not only affected my children’s role in the family but also my parenting style. As any parent of more than one child knows, the same ingredients don’t necessarily produce the same results and so how I parent each of them reflects the very different personalities of my apparent clones – well that and the experience acquired over many years on the battlegrounds and in the trenches of parenthood. While I’ve never been a fan of parenting style labels, if I were to assign myself one I believe the lesser-known but probably largely practised “survivalist” might cover it best – a parenting style very much entrenched in whatever gets you through the moment, never mind the day. Parenthood first time around is both exhilarating and terrifying. The weight of responsibility and desire to get it right and protect our adored and precious offspring is enormous. So it’s no surprise that parents are often stricter and over-protective first time around. Even within the safe confines of the playground it’s pretty easy to spot the first-time parent, hovering as their little darling plays on only the age-appropriate equipment, and ensuring the merry-go-round doesn’t exceed first-time parent acceptable speed limits. By second and third child (and beyond) anything goes really and even the proud call from a three-year-old who has snuck to the top of the helter-skelter slide is less likely to provoke feelings of terror as he dangles above the slide and more feelings of “he better not get stuck, because no way am I climbing up there”. The world can seem a scary place when you’re a parent, and life and world events take on new meanings. With my eldest, going outside to play was a no-no unless I could see her directly from the front window. Her suggestion of calling for a friend around the corner was deemed preposterous, as who knows what danger she might encounter on the short stroll, in a suburban cul-de-sac, out of my line of vision. By contrast I recently put a call-out in my 10-year-old middle child’s class WhatsApp group. “Eh – I don’t suppose anyone has seen my son?” I asked when a quick survey of the street and trip to the local green revealed no sign of him. A degree of panic and several phone calls followed from parents within the group who had checked with their sons as to their last sighting of mine. I, however, was rather more blasé about the whole thing. “Ah no doubt he’s in one of his friend’s houses,” I replied, “it’s just a case of figuring out which one”. “You’d have killed me, if I did that!” my eldest said. She was probably right. It’s not that she was more precious, or even that standards have slipped – though to be fair a degree of that is inevitable. It’s rather more a case that my sense of realism about potential dangers has been fine-tuned. And wrapping kids in cotton wool and micro-managing their every activity serves to benefit no one. Still, even knowing this “the fear” can return. Sometimes it’s because of the nature of a particular child, regardless of their position in the family, and other times it’s because “firsts” keep happening. The playground becomes the much anticipated post-Leaving Cert, rite of passage trip to Magaluf – and I’m sick at the thoughts of it already. “No, you can’t have a Big Mac meal. You’re only eight – you can have a Happy Meal,” I called to my son in the back of the car.